We carry all the different sizes in white. We also carry a size #3 and above in red, yellow, dark blue, or dark green. We can custom make any merchandise tag you might need. These tags are printed in red and yellow ink and come in various sizes and shapes. We carry two different types of furniture tags in stock along with sold and hold tags. A one-part tag printed on two sides with a bottom perforation. 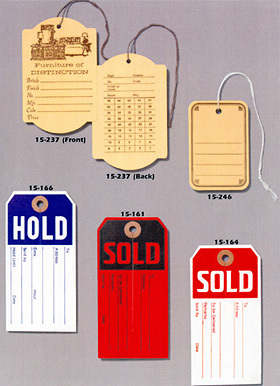 We carry a one, two and three part inventory tag numbered up to 5000 in stock. You can see what these tags look like by viewing the stock tag brochure. We simply could not list all the retail merchandise tags we carry in stock. If there is a retail merchandise tag you need that is not listed, please note what yo need on the inquiry form. Chances are we can get it for you.